Than this project is unique? Script "Forward, Black!" became the first in the history the work of art, which events came true later in several multimillion countries it is ideal by dates or to circumstances (revolution with mobile phones in Egypt 25.01.2011, events in Ukraine 2010-2014). Therefore, in the first publication the author at once named Nostradamus. It is awarded by the Hollywood film producer, the coauthor legendary "Santa Barbara" for the best script of the full-length art movie of 2011. Record of the air from the Ukraine palace of 23.02.2012. In Day of Slavic Writing of 2013 at ceremonial meeting the Union of Writers of Russia for the first time in history handed over the membership card to the author of unpublished work (the script "Forward, Black!"). 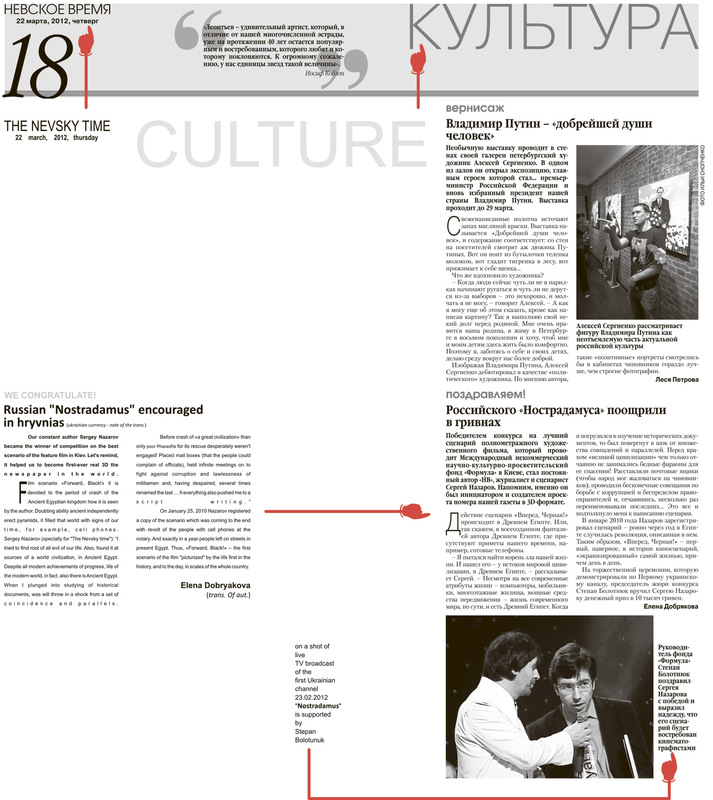 In the performance one of new colleagues compared Nazarov Sergey to Lev Tolstoy. All these circumstances provided to the project a big response in the world, and his superidea – understanding to people of the different countries and cultures. The editor of radio "Liberty" compared this work to work of Hangtington "Collision of civilizations" and estimated potential audience at million audience. ello, dear guest! Sometimes even I feel surprised at everything that happened. But the annual award of the international jury for the best scenario of a feature film in 2011 finally convinced me not to consider it as an accident. And believe me, the similarity of the plot of the movie and my autobiography is not a vanity sign. Despite the fact that you can see periodically a movie about me on on TV which also won the prize of the international film festival, its authors skillfully passed over the main issues in silence. That is why I have decided to get down to business myself. y choice of Egypt (inhabitants called it Black) is not even an attempt "to dig to the roots", but an association generated by long-term experience in various spheres of life. On the whole papyruses extremely resemble to today's mass media: total corruption, absolute disregard for laws by the authorities and distrust of courts. The management methods are similar too (it is an instinct, isn't it? ): the replacement of a cult deity, slim down the bureaucracy (ineffective as usual), endless meetings and conferences, hypocritical discourses about the advantages of a healthy life and anti-alcohol campaign (inherently unable to be implemented). I am sorry for the banal beginning. But it is a kind of an essential "frame" for the main "brilliant". ertainly I am not an discoverer of ancient secrets (as Newton told: "If I have seen further it is by standing on the shoulders of giants), and as for me, I just have ascended this top from the other side, if I may say so. Smart Egyptologists noticed long ago that in 50 years (a real trifle at that time!) 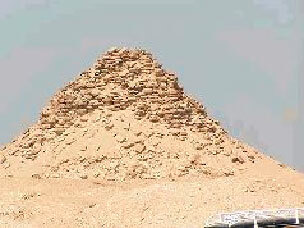 the "construction" industry of the Ancient Kingdom made a great advance. During the whole history of the world we see it only nowadays! But progress is evident in all spheres including the erection of pyramids both from concrete and from data carriers - the basis of any advance. And the hieroglyphs of the times of Cheops remind the Soviet propaganda. 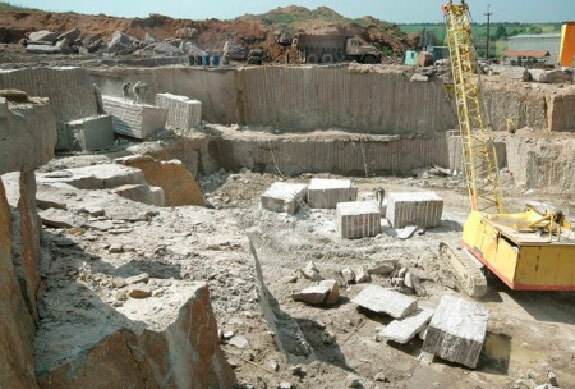 According to them, million tons of stone were cut down, transported on tens kilometers, polished and laid so that it is impossible to insert a knife between the blocks, at height of a modern skyscraper, using the labor of less than 600 people for one huge block. Just to check the correctness of my words practise on couple of stones and make sure that it is impossible. y the way just after the completion of the Pyramids the revolution took place. And it became a kind of omen – great building predicts the very end. And the film would be expected to become just one of typical historical dramas. No wonder most people would be rather skeptical and remember one picture that we all saw in our textbooks, I mean sand hills and people pulling massive stones. But just look at the Pyramids in two centuries after Cheops. How could the whole civilization in the huge territory "forget" all its experience? Historians are ignoring this unique fact. And then, compare stone quarries at the time of Cheops to the modern ones. 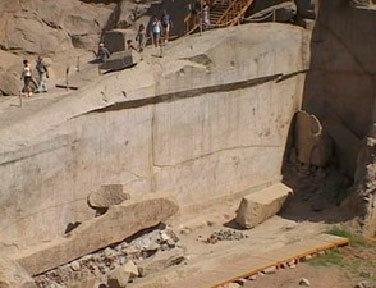 The contractors of the Pharaohs of IV dynasty seemed to cut quartzite by laser or plasma. Who wants to laugh at me, let offer at first your own clean-cut explanation. And do you know why now they do not use these technologies? They are madly expensive! person who was interested in my explanation… will watch the movie. Though it is possible to look back and guess everything. As for me, the plot was not a purpose but just a kind of method for expression the main idea. Therefore, revolt 25.01.2011 in Egypt – is rather a sign for other people. The mass media are writing about this story now, comparing me to Nostradamus. Specially for haughty "educated skeptics" I'll repeat probability calculation of the so-called "casual coincidence". The plot of the movie moves during a year and comes to an end with the revolution in Egypt with cell phones. 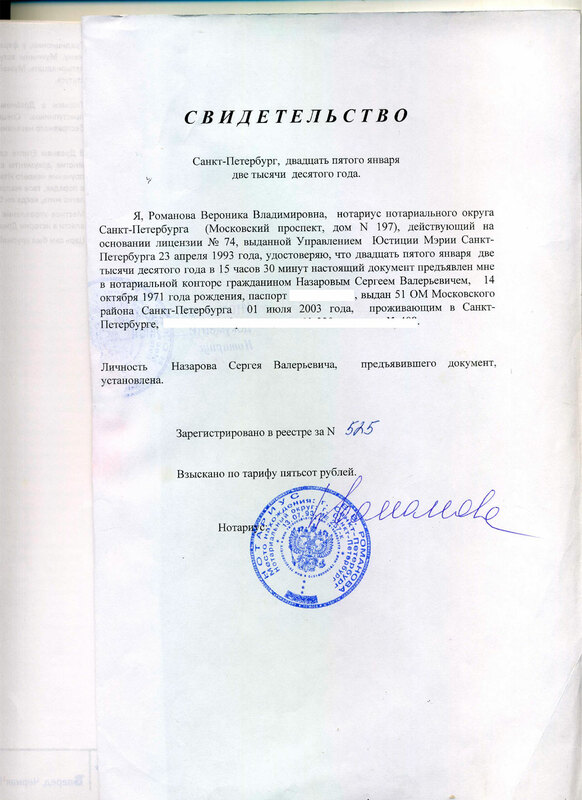 Here is the scanned copy of notary registration of the scenario on 25.01.2010. Multiply 242 countries in the world to 365 days in a year. It equals 1/88 330. But how did I manage to predict a year?? In the summer 2010 one journalist directly asked Egyptian politician A. Musa: "Don't you expect a revolution in the near future?". And his reply was: "For sure not in the next years!" It turns out 1/264 990 for 3. During 120 years of the history of cinema about 15 000 000 scenarios have been written. And there has been no such a "coincidence" particularly revolutions with cell phones. So "Forward, Black!" steps over the bounds of an ordinary historical film. I'd like to say that I am endlessly thankful to celebrities and simple people, who support me and feel the truth in my work. Copyrights to idea, plot and the scenario are registered according to the procedure corresponding World conventions "About copyright protection" (and item 17 of the interconventional conciliatory Report with the Bern convention) and protected by national legislations of the signed states.